Next month, the Rotary Club of Memphis, which was chartered in 1914 and has seen much local history, will embrace one of the most honored and venerable symbols of that history when it begins its regular weekly club meetings at the historic Clayborn Temple downtown. Our move, which was approved this month by an overwhelming vote of our membership, is meant to align the activities and aspirations of our club, which in the century-plus span of its existence has lived by the motto “Service Above Self,” to the temple, which, in the same time frame as our own, has itself represented that ideal, and heroically so. In particular, our intent is to honor and commemorate the historical importance that Clayborn Temple played in the civil rights movement as our city approaches the 50th anniversary of the fateful sanitation workers strike here and the participation in it of the great martyr Dr. Martin Luther King Jr., who gave his life in that struggle. 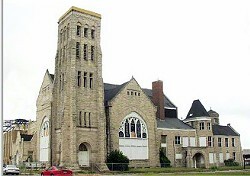 At 124 years old, Clayborn Temple is already listed as a local architectural treasure on the National Register of Historic Places. Earlier this year, the temple received additional national recognition from the National Park Service for its historical importance as the central meeting place for the sanitation workers during those strike days of February through April of 1968. Located at the northeast corner of Hernando and Pontotoc, just south of the FedExForum, the temple began its life as the magnificent venue for the Second Presbyterian Church, which constructed the building in 1893. During the 1960s, Clayborn Temple not only continued as a house of worship for its congregation but entered history as a showcase for the gospel in action. It began to serve as an important central meeting place for the civil rights movement. It became the headquarters for the striking sanitation workers and their supporters and a starting point for the strikers to assemble before their solidarity marches. Despite its celebrated history, Clayborn Temple sat vacant, in dire need of repairs, after its congregation moved away and closed its doors almost 25 years ago. Endeavoring to save the building for posterity as a symbol of economic justice and civil rights, Frank, Smith, the owner of Wiseacre Brewery, joined with Thompson to form the aforementioned nonprofit, Clayborn Reborn, to see to the building’s restoration. Rotary’s move into the structure as a regular venue for our meetings is meant to assist as an active part of that restoration. This move is bigger than the citizens and community activists who make up Rotary. When we joined the club, we made a commitment to networking and community service, and this connection to Clayborn Temple gives us the opportunity to be a part of something majestic, and hopefully to help make an impact on our city and the nation. The 50th anniversary of the events of 1968 will be a hallmark time, and the Rotary Club has chosen to be at the right place to play our part in the commemoration of the past and the unity of the present. Arthur Oliver is president of the Rotary Club of Memphis, which is part of Rotary International, the world’s largest humanitarian service organization. Corker Opens Up on Trump's Shortcomings, Sees Need for "Radical Changes"